On 4/20/07 (Friday) - 4/21/07 (Saturday) I went to the Monterey Horse Show (in the Monterey fairgrounds, California) to see my friend Christina Galindo, and to see her daughter (Melanie) ride. Below are some pictures from the two day outing. Click on any picture to get a HUGE version of that photo. 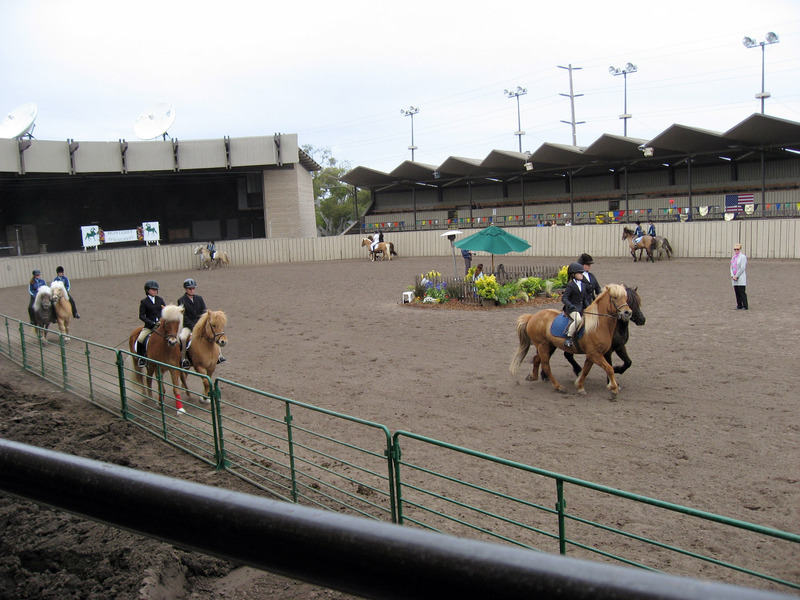 I had never been to a horse show before, and it was very fun and interesting. 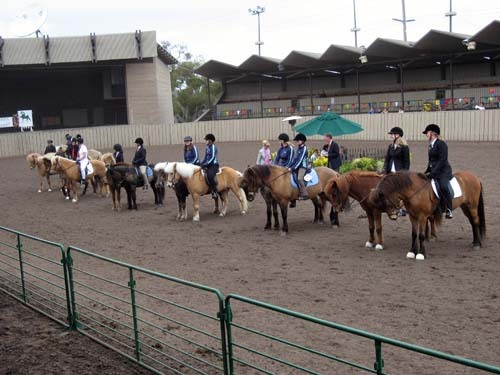 The idea of the show is that for 3 or 4 days about fifty to a hundred owners and their horses come together and get judged for their riding skills, their horse's behavior, and a bunch of other things I really don't understand. 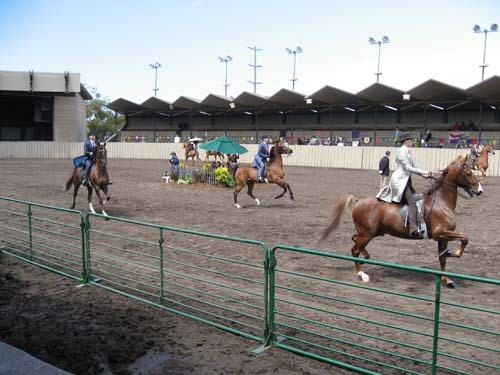 :-) The competitions are all in one main arena, but the REST of the fairgrounds is organized into little compounds based on the stable you are from. The stable my friend is with is Monarch Stables (http://www.monarchstables.com) which is owned and run by Brigitte Scholl. Below you can see the Monarch Stable area of the Monterey fairgrounds during this event. 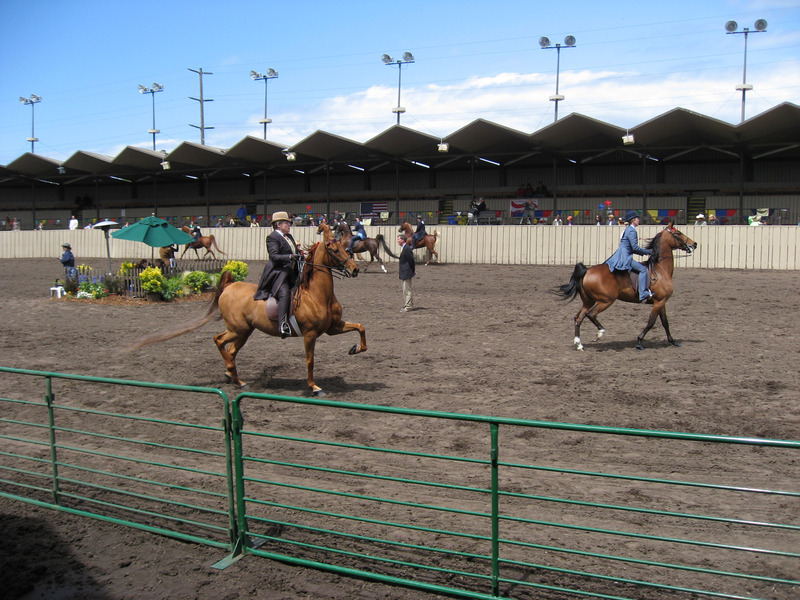 You can see the show horses are stabled here in this area, and the owners/riders hang out here waiting for their particular competition. Notice on the left of the picture, all the ribbons that participants from our stable won are hanging up for others to see -> all the stables did this same thing. 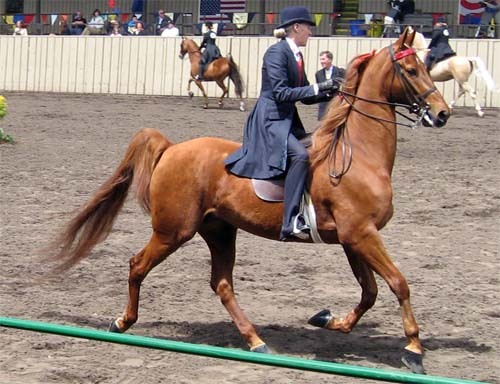 This particular horse show is focuses a lot on the class of "American Saddlebred Horses" (and a few others like "Tennessee Walking Horses") and Monarch Stables focuses on this type of horse. Below is Melanie, with Samantha on her back. The horse in the picture below is "Barbie" (notice the pink halter on Barbie's nose). 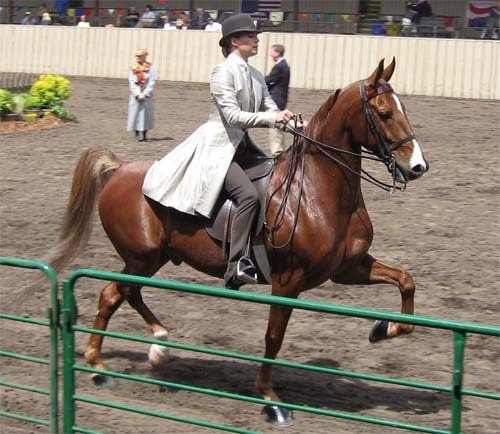 The name "Barbie" is the "barn name", Barbie's show name is "Royal Crest Rockapella". For the 3 or 4 days of the event, most of the time is spent socializing and waiting around. Of course Brigitte (owner of the stable, and primary trainer) is very focused and VERY busy the whole time and making sure everything is organized, and so is her staff. 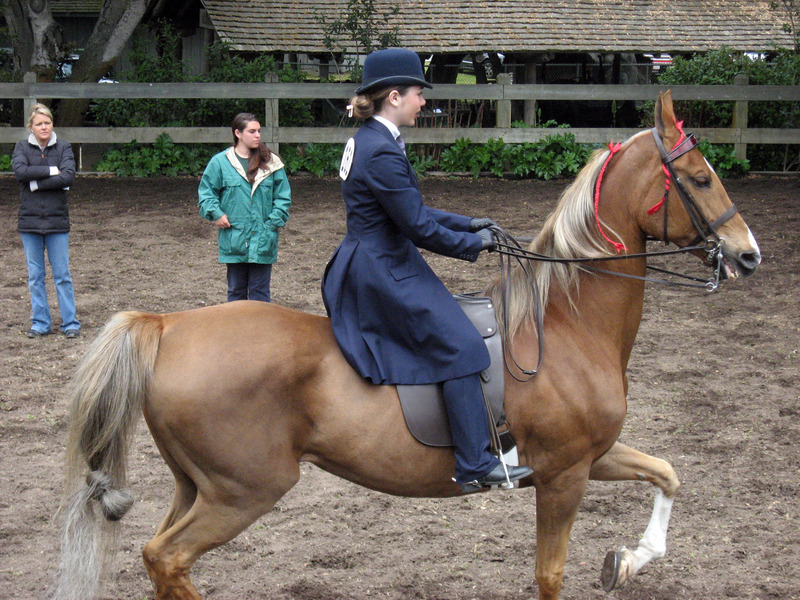 But the horse owners probably ride once or twice per day for 20 minutes each, and the rest of the time is spent relaxing and socializing and supporting whatever riders happen to be preparing for an upcoming ride. It was a SUPER fun, relaxed, and supportive group that all knew each other, it was nice being around them. 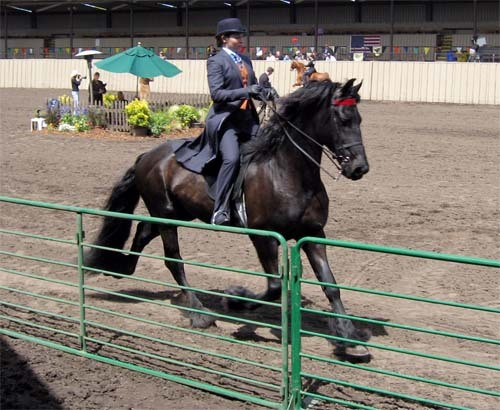 Below is Dana with his horse "Glor van der Bist" (barn name "Glor" or "Glorious") which is a big beautiful "Friesian Horse". 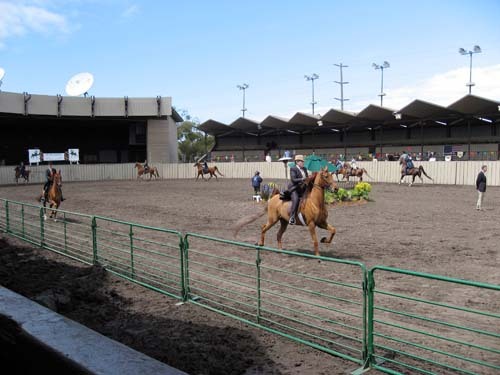 If you notice in all the pictures, the horses can lean out and see each other. They are social animals, and it is comforting for them to see their regular stable mates in this strange environment, so the horse stables are organized in a cluster and with the top half of the stall doors open the horses can see each other and their owners. Below is Lynn kissing her horse named "Magic of Oz" In the back ground working you can see Brigitte Scholl (stable owner and head trainer of Monarch Stables) and the stable boy Sammy. Brigitte and her staff never stopped moving or working, they were the only ones that never got a break the whole time I was watching. Ok, so the next few pictures are all about what happens when it is one rider's turn to compete. We'll use Melanie as our example and follow her through the process. :-) This same process repeats itself 20 times every day. Here is how it goes -> 30 minutes before an event that Melanie is riding in Melanie must put on makeup and get dressed in a suit, tie, and hat. 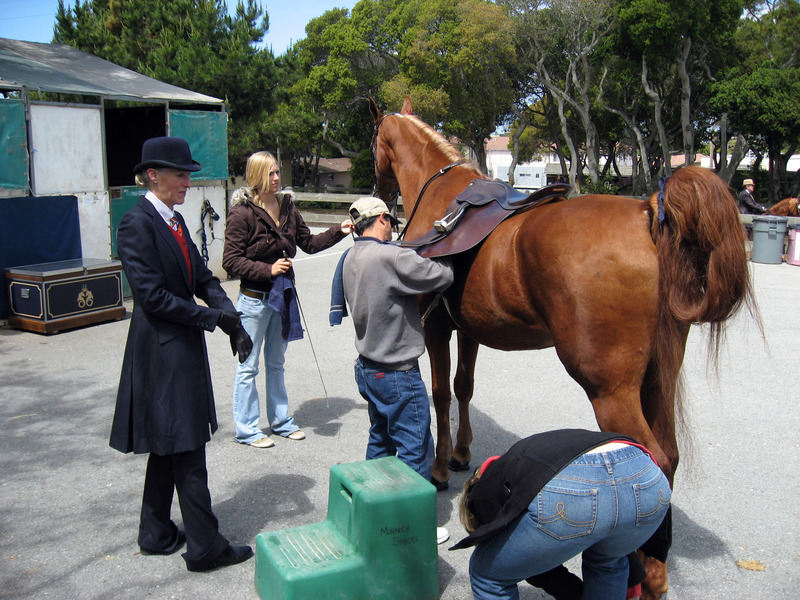 Meanwhile the horse gets brushed, polished, and spiffed up for the event at the same time. 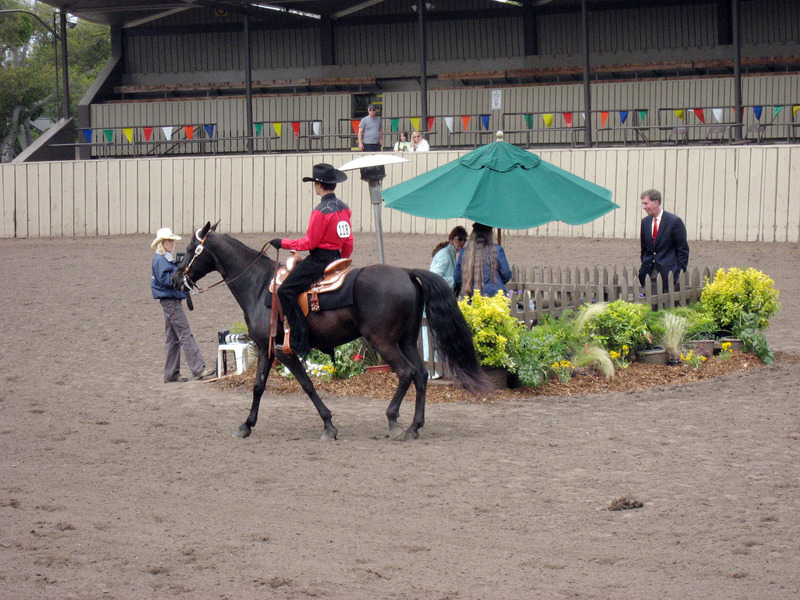 About 15 minutes before the event Melanie gets on the horse, and goes to the "warm up ring" with the horse and does a small amount of riding. Then at the time of competition they go to the main arena and ride for maybe 10 minutes total under the judge's scrutiny. Below is the FIRST stage, Brigitte (head trainer) is putting on Melanie's makeup. Notice Melanie is still in her street clothes. A few minutes later, Melanie comes out of the dressing room dressed for the ride (she's on the right below). 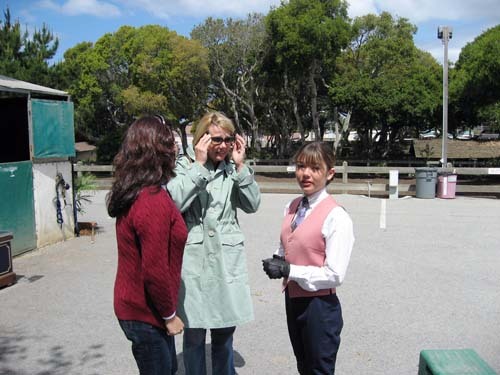 That's Christina (her mom) on the far left, and Anne in the sungalsses. Brigitte organizes Melanie's tie and tie-pin. 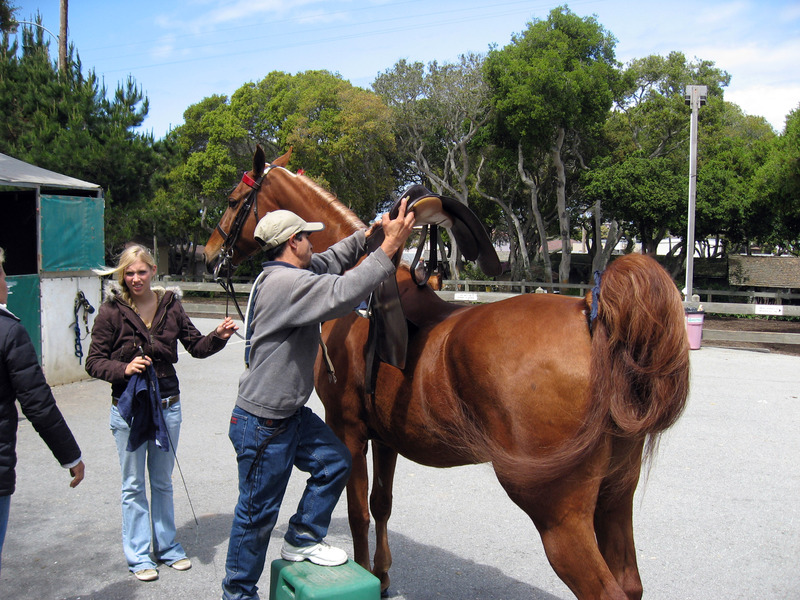 Ok, now it is time for Melanie's horse to get prepped. Melanie rides "Barbie" below. 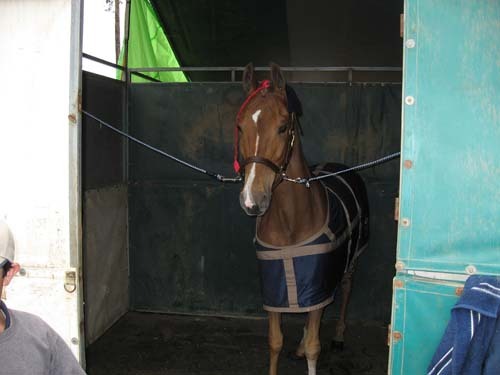 Barbie is led out of her stall and into the preparation stall (seen below). 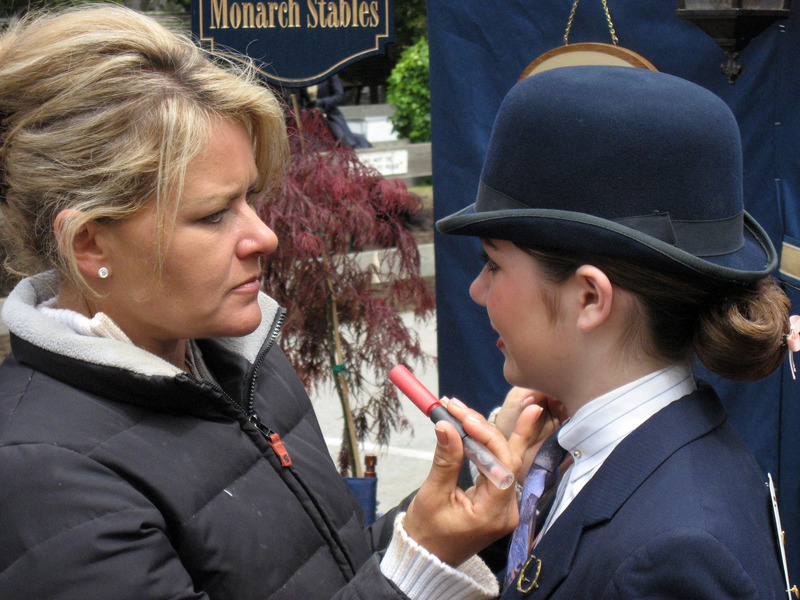 A team of people descend on Barbie and "make her pretty" for the upcoming ride. 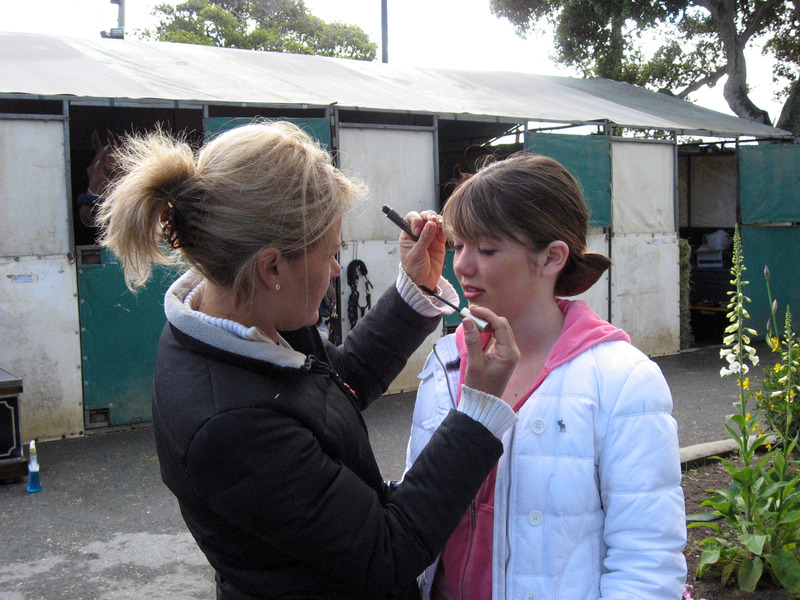 Sammy (one of the stable boys) paints Barbie's feet. This is like shoe polish, it makes the hooves look great for a short time. Below you can see Sammy prepping Barbie, Melanie is helping, and Brigitte is coming in to figure out what is left to be done and check up on everything. 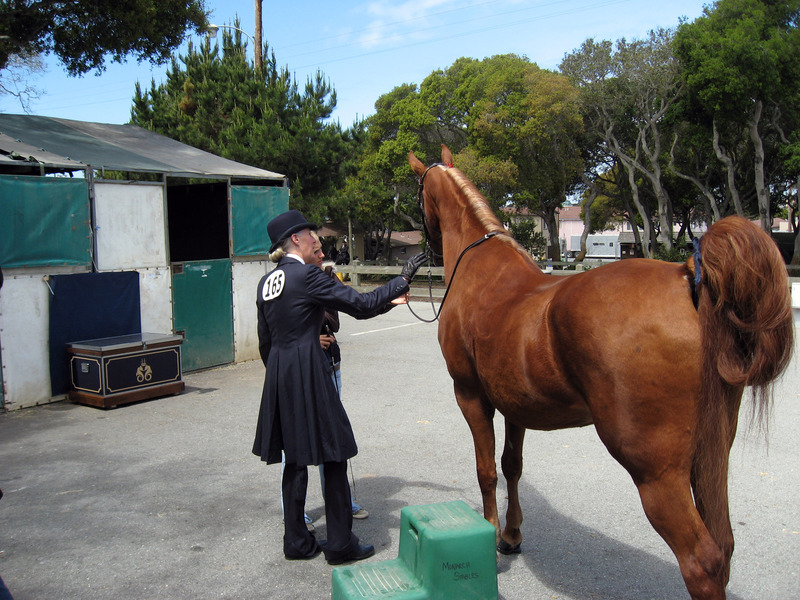 Below is a video of this mayhem as 4 people prepare the horse for the show. :-) Click on the video below to play the YouTube version. You can click Super High Quality Windows PC Version Here for a much nicer, bigger version that will not play on a Macintosh. You can click Super High Quality Windows PC Version Here for a much nicer, bigger version that will not play on a Macintosh. 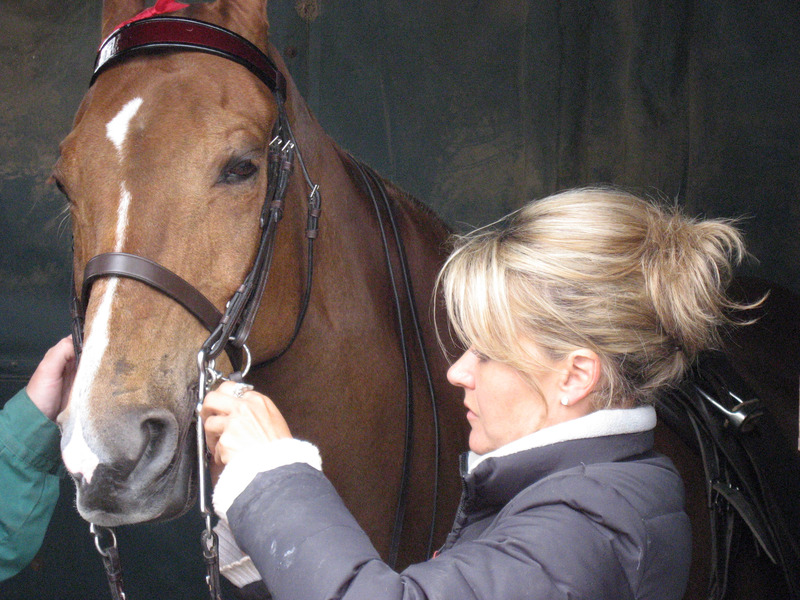 Barbie (the horse) is almost ready, Brigitte puts on the bridle (bit?) 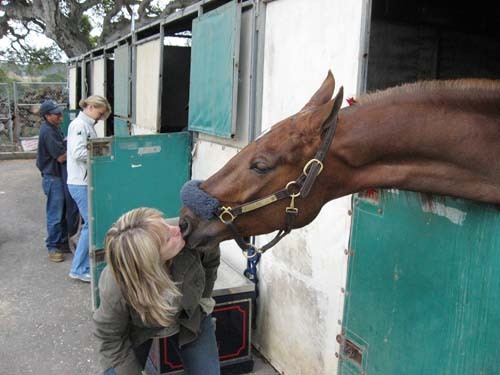 to prepare the horse for Melanie. 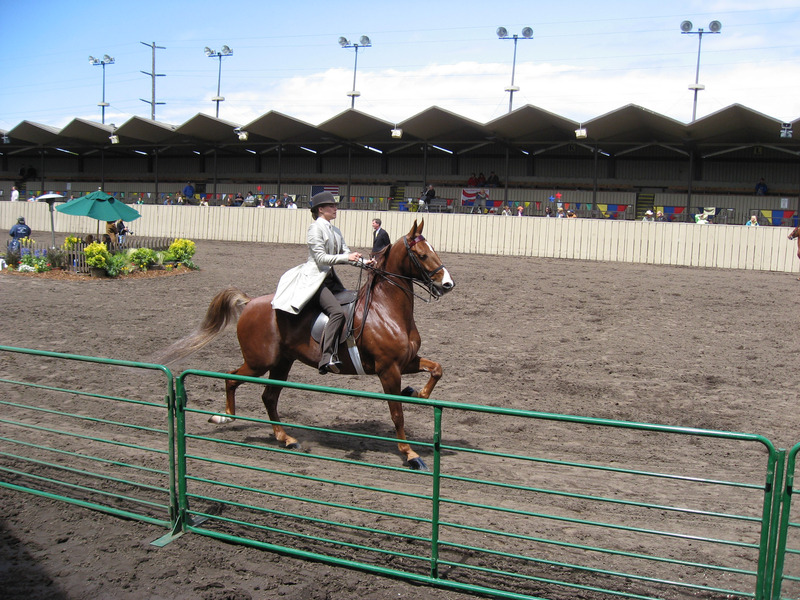 The horse is led out into the main area where it can still see all the other horses (so it is calm), and Melanie mounts. That is Jane in the green coat holding the bridle. 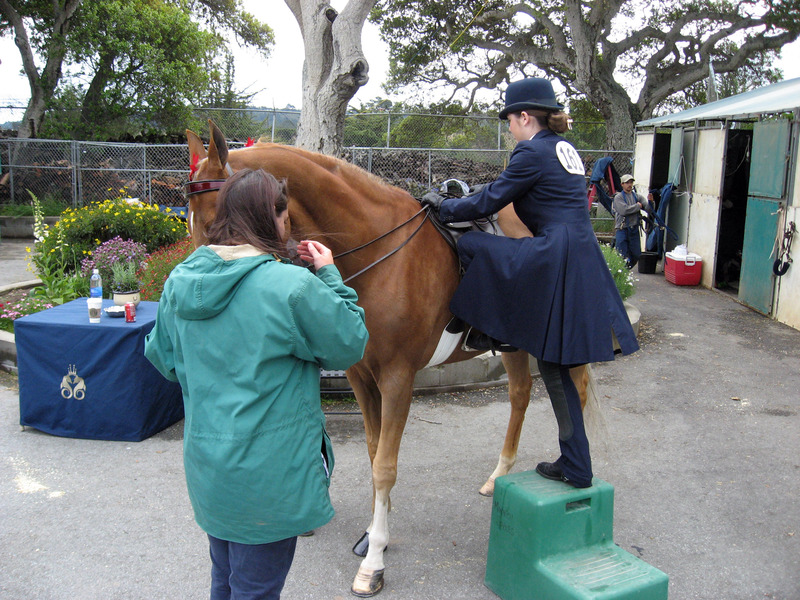 Brigitte makes some final length adjustments, making sure everything is perfect for the ride. 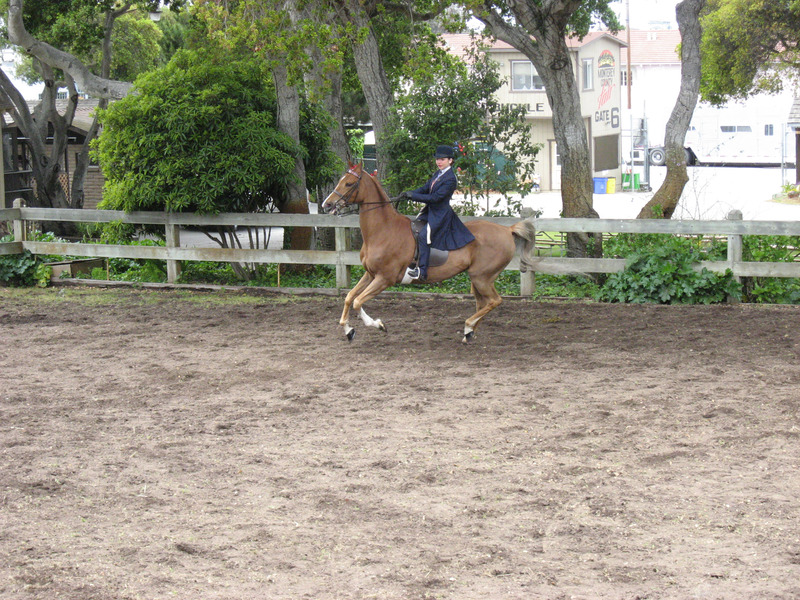 About 30 yards from the last picture, here is Melanie warming up in the practice area. 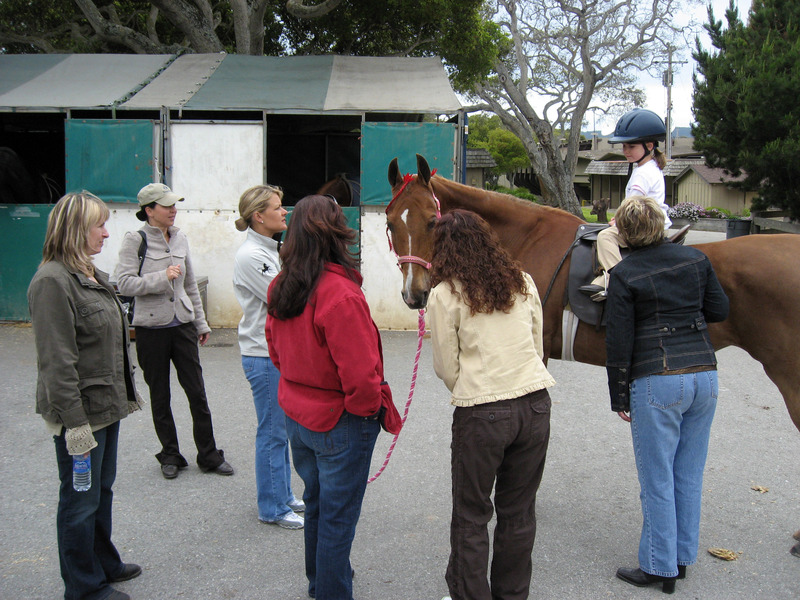 Brigitte is on the far left looking on, and giving Melanie advice and pointers. 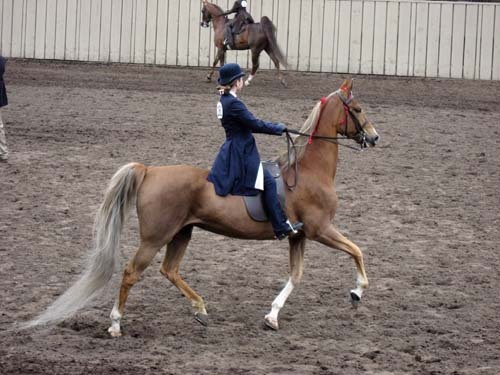 Notice that Barbie's tail is in a loose knot -> this is to keep it clean and off the ground during warm up. 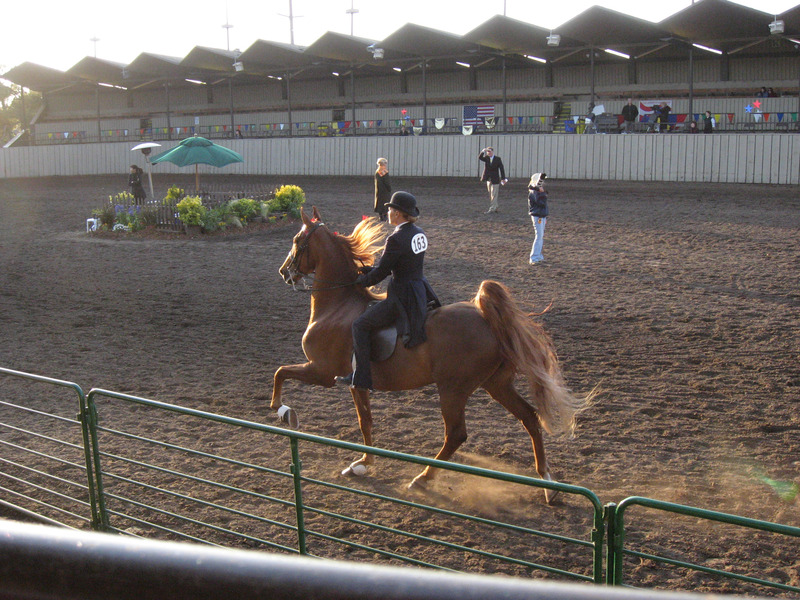 At the very last minute before competition the tail is let out so that it drags on the ground during competition. 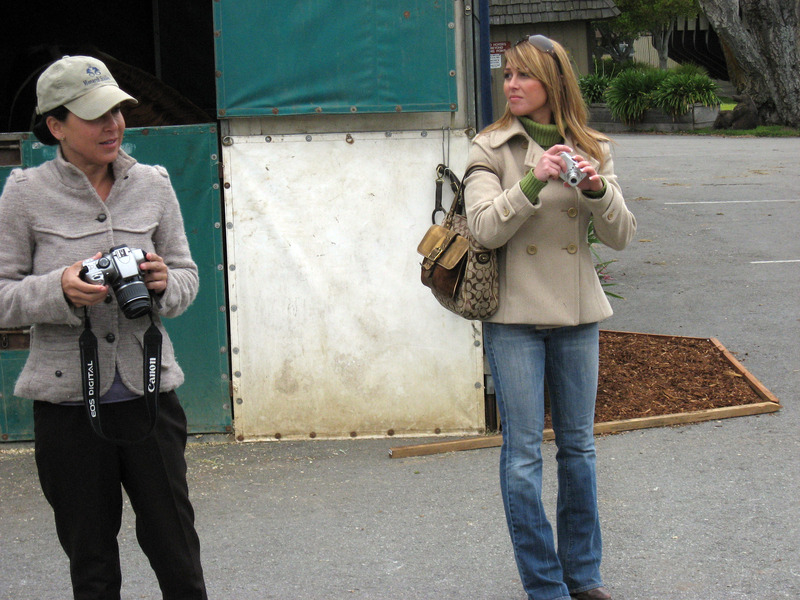 Jane (Brigitte's assistant) is in the green jacket. Melanie with a smile, thundering around in a circle warming Barbie up. 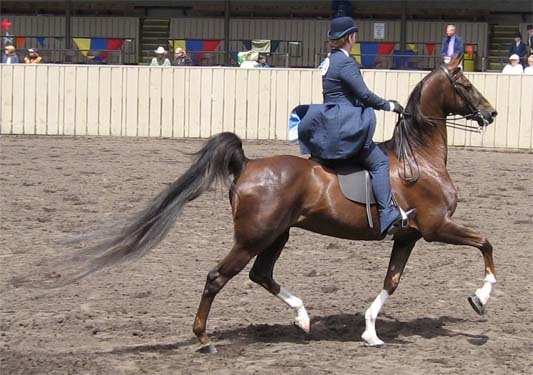 These horses are BEAUTIFUL animals even when they are standing still. When they pick up speed they are magical and majestic creatures, it is amazing to watch. 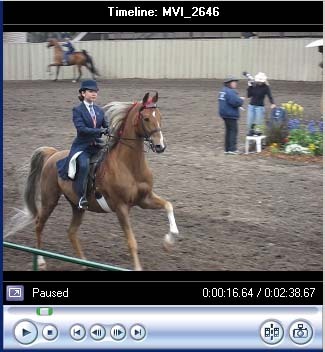 Below is a video of Melanie riding Barbie in the warm up area. Click on the video below to play the YouTube version. You can click Super High Quality Windows PC Version Here for a much nicer, bigger version that will not play on a Macintosh. 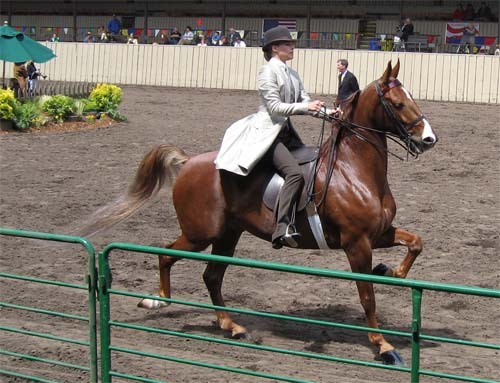 Below is a video of Melanie riding the American Saddlebred Horse "Barbie" in the actual competition. Click on the video below to play the YouTube version. You can click Super High Quality Windows PC Version Here for a much nicer, bigger version that will not play on a Macintosh. Finally, when the competition is over (it takes about 10 minutes of riding), the riders all stop at attention in a big row, and the winners are announced. Below is Melanie in the lineup (second from left). All done! 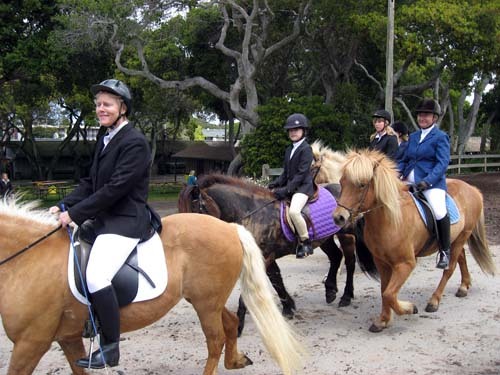 Back to the stables to hang out for another 5 hours until the next time Melanie rides. 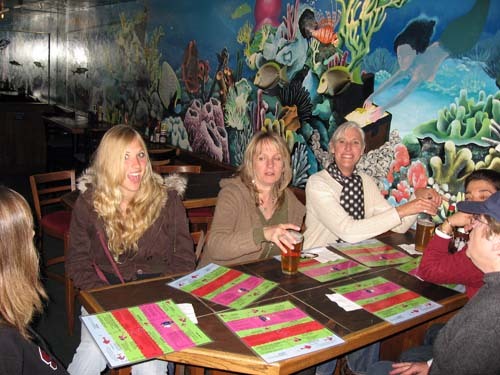 Below is Melanie and her mother Christina on the right in red. 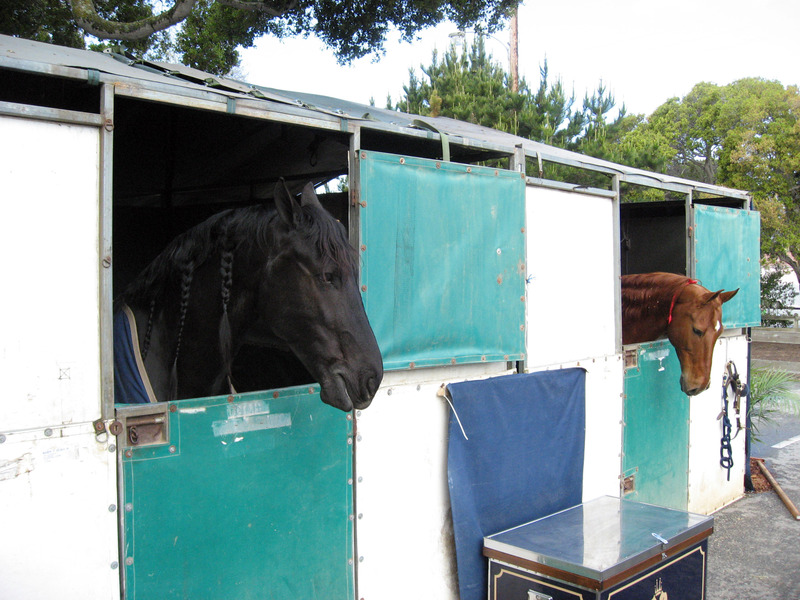 A random picture of Glor and Su Casa (stable name "Casa") horses hanging out at the fairground, waiting for their turn to show. 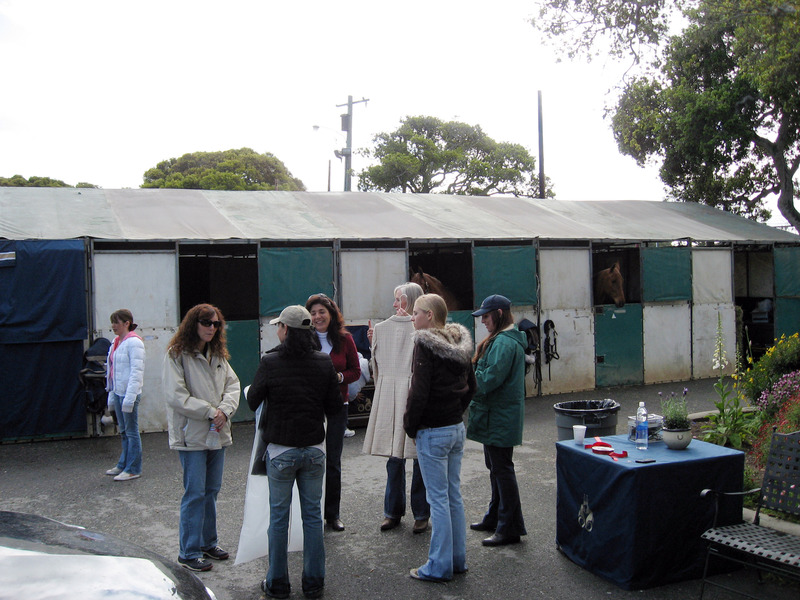 Congregation of owners and trainers in the Monarch Stables area. Melanie in the white jacket on far left, then Sherry, Julie facing away, Christina facing, Julie, Steph, and Jane on the far right. Below is Christina pulling on Oz's tongue, sort of a silly game this particular horse seems to enjoy. I didn't get the photo, in the picture below Christina has JUST let go of the tongue as it is pulled back. 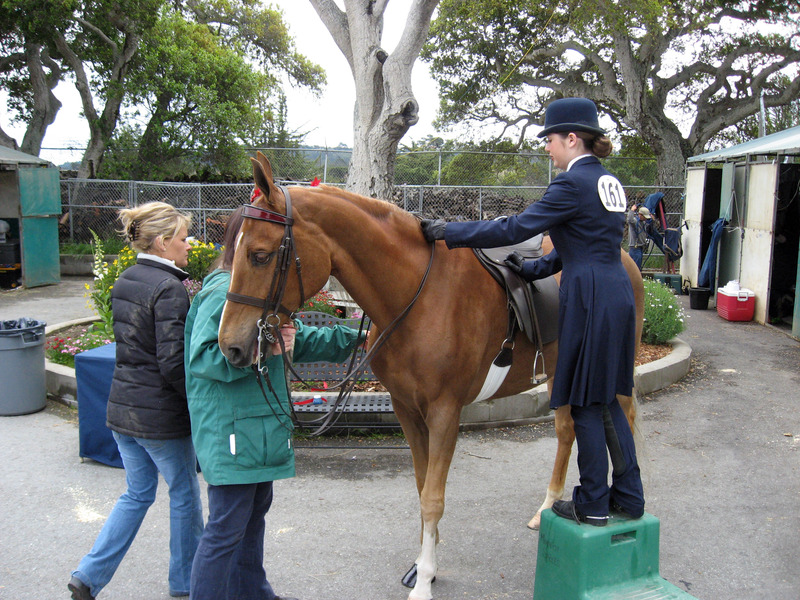 Julie prepares the next rider for the same thing Melanie went through above. 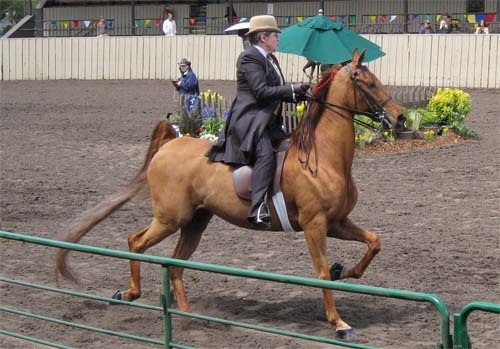 The rider is Alex. 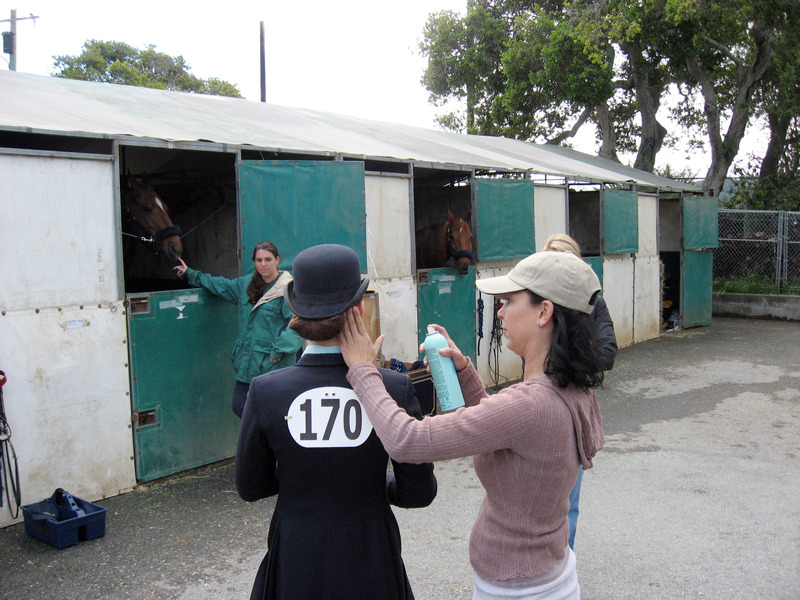 Here they are using hair spray to make sure everything is perfect. 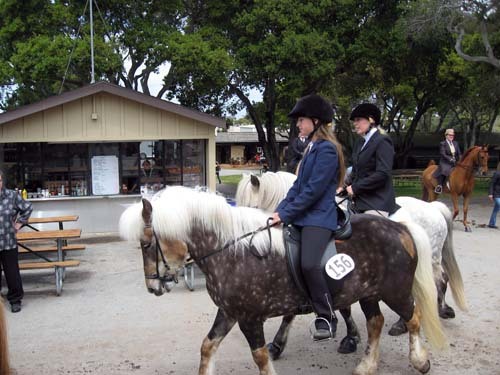 In the competition below, notice the horses do not have saddles!! 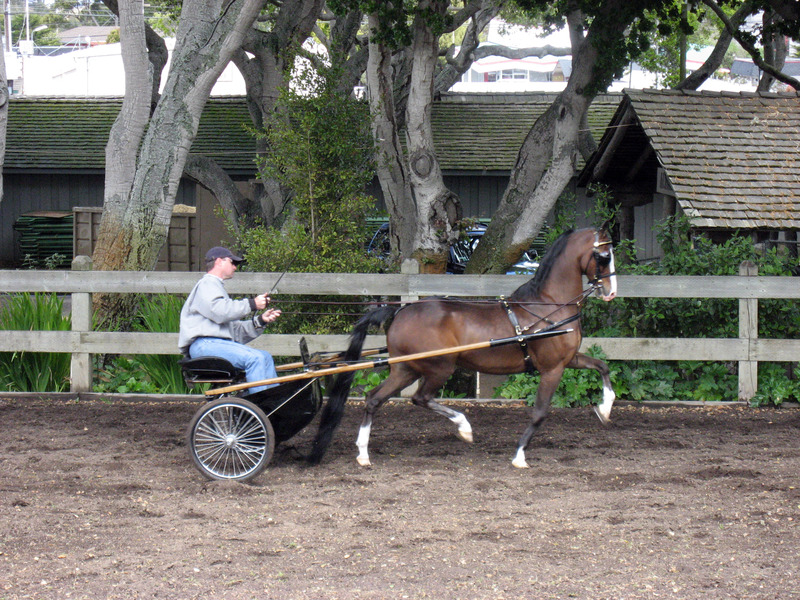 The owners (or "Handlers") lead them around the ring, sometimes up to a "trot" (the handler is running to keep up this pace). In this particular competition (I'm told this is the "Halter" or "In Hand Class") the point is to see the horse's natural movement without a rider on it. Same as above picture, just a little closer up for detail. A rider we know called Julia from another stable. In the picture below, it points out how long these horse's tails are! Also notice that the tail seems to be very perky and the hair seems to magically stand up vertically for the first 6 inches. There are two ways this occurs, and neither is "natural". One way is a horse cosmetic surgery procedure called "Tail Setting"!! 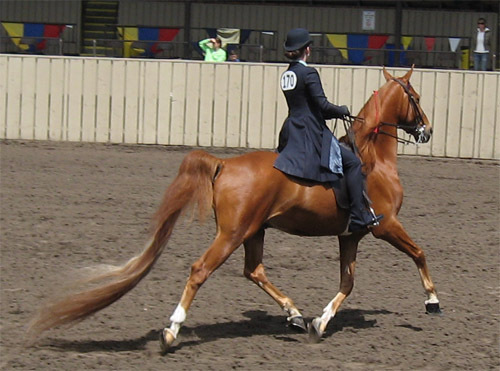 The other way is a device called a "humane tail brace". 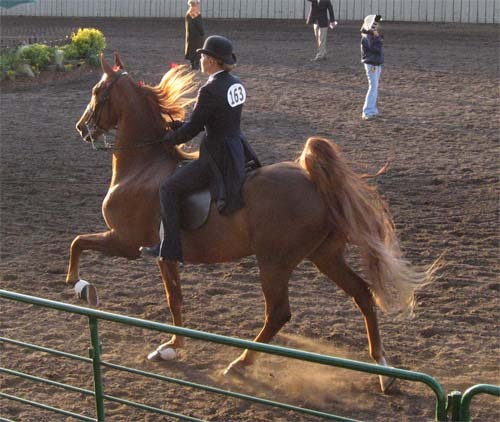 Oh, if the horse's tail isn't naturally long enough to drag on the ground, the horse gets a hair extension! :-) A "fake tail" is knitted in to give it this very long look. 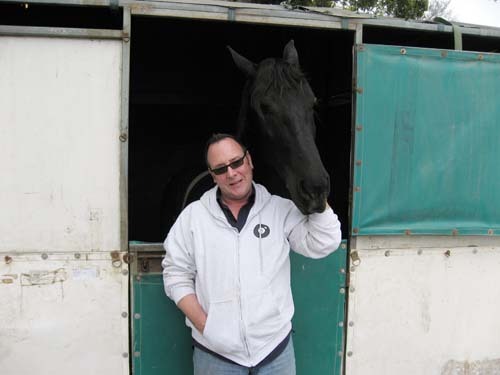 The picture below is of Alex, and the horse is named "Rhett". 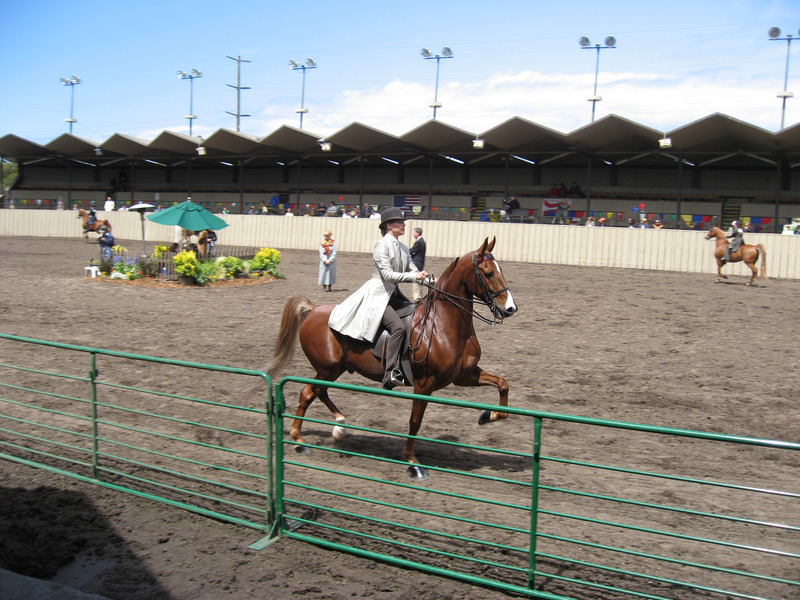 There were MANY different interesting types of competitions which were called "classes". In the picture below, it shows a "2 wheeled cart" class. 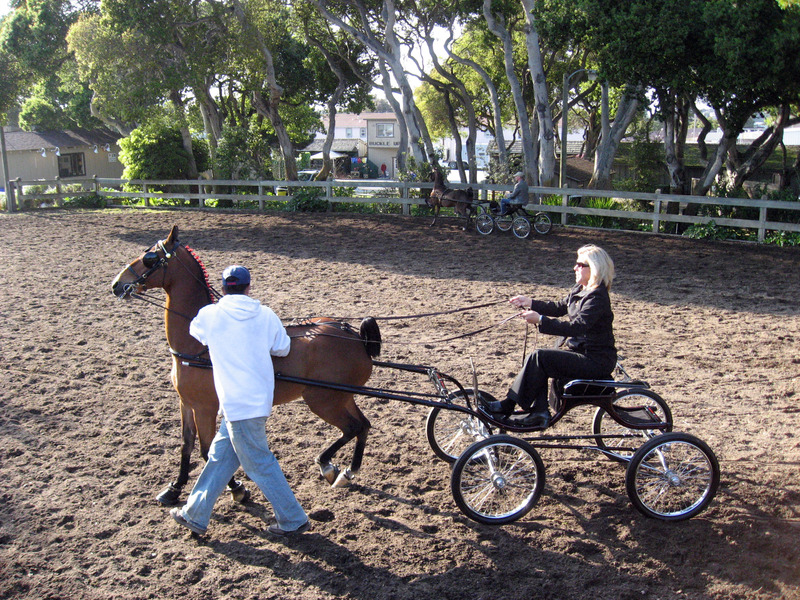 Below is an entirely DIFFERENT class of "4 wheel carts". 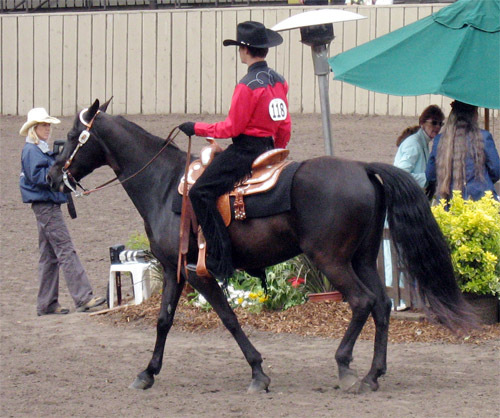 In the class below, this is a Tennessee Walking Horse, and a "Western Type of Class" of some kind (I'm told by a friendly reader this is a "Western Pleasure Class"), all the participants wore traditional cowboy hats and western style shirts. 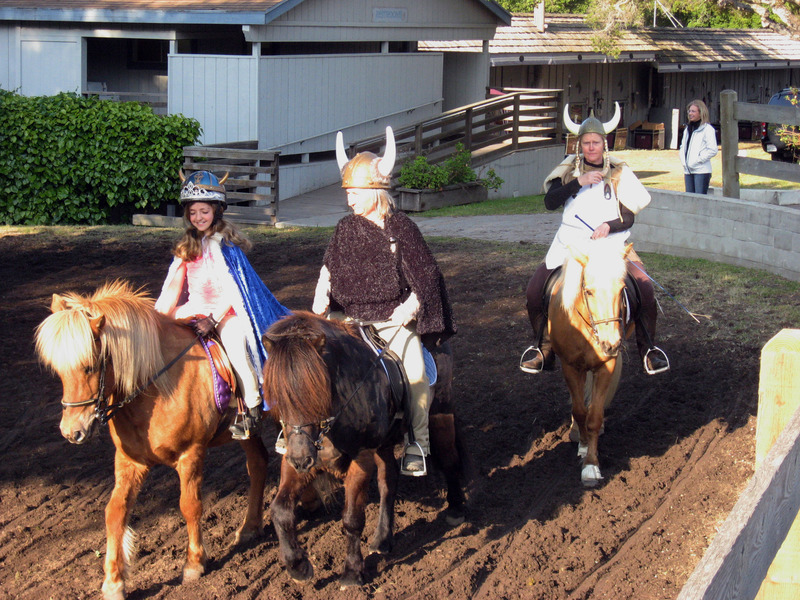 Nobody could explain what these people were doing, some sort of a "Viking Class". 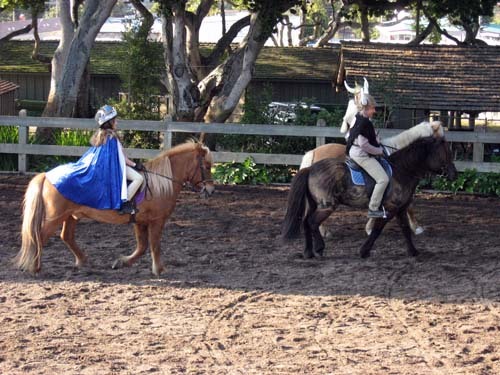 Vikings dressed up on horses. 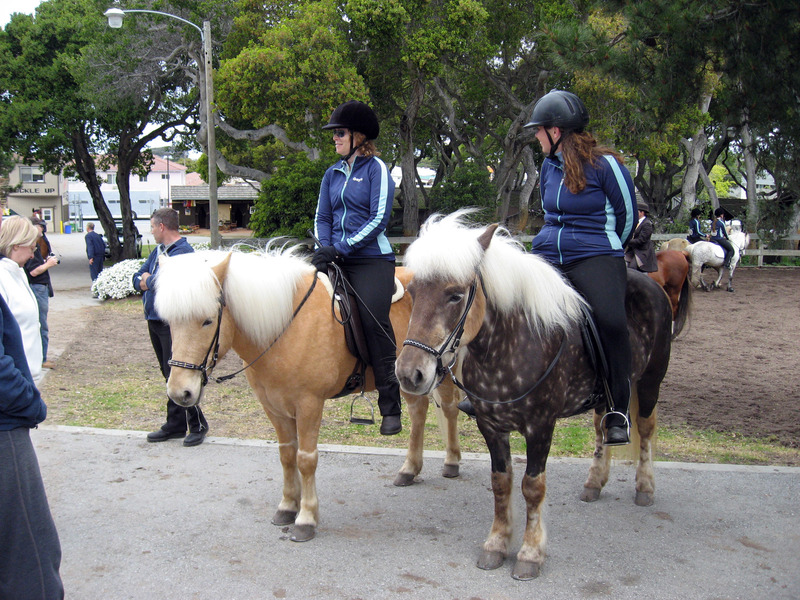 One of my favorite classes/horses I saw for the very first time were these "Icelandic Ponies" pictured below. They are called "Ponies" in the United States because of their height, but in Iceland they are called "Icelandic Horses". More Icelandic Horses pictured below (this picture taken the next day). I love the manes, which during competition parts and bobs and waves around wildly. 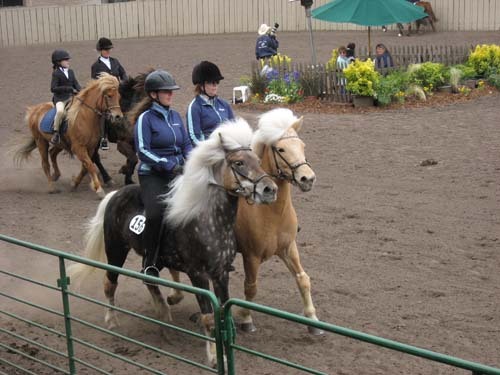 Below are the Icelandic Ponies in competition. In the class below, the ponies work in teams of two, and are judged on their coordination. 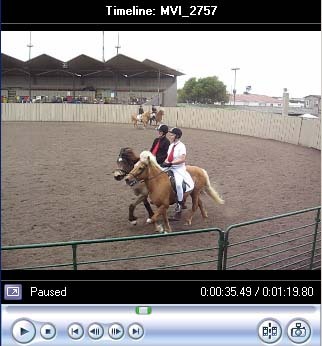 Below is a video of the Icelandic Pony Pair competition. Click on the video below to play the YouTube version. You can click Super High Quality Windows PC Version Here for a much nicer, bigger version that will not play on a Macintosh. 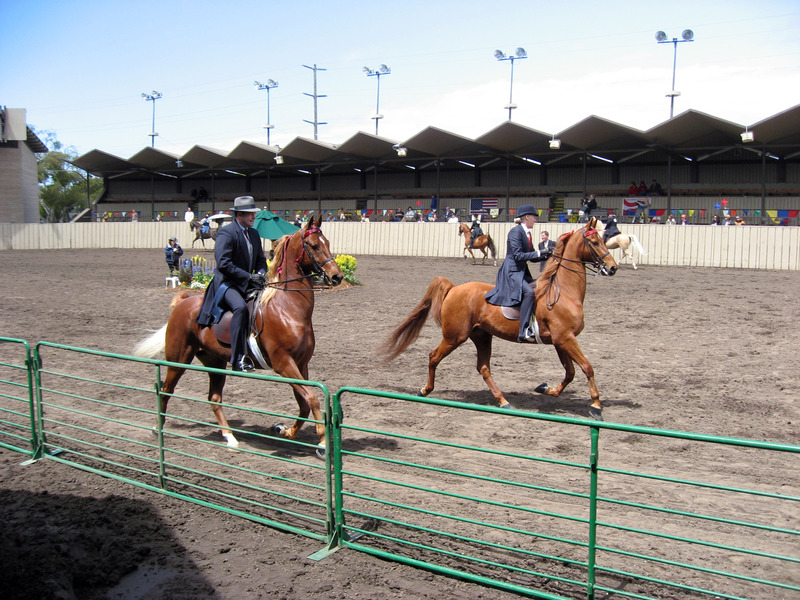 One more picture of the Icelandic Horses in competition. 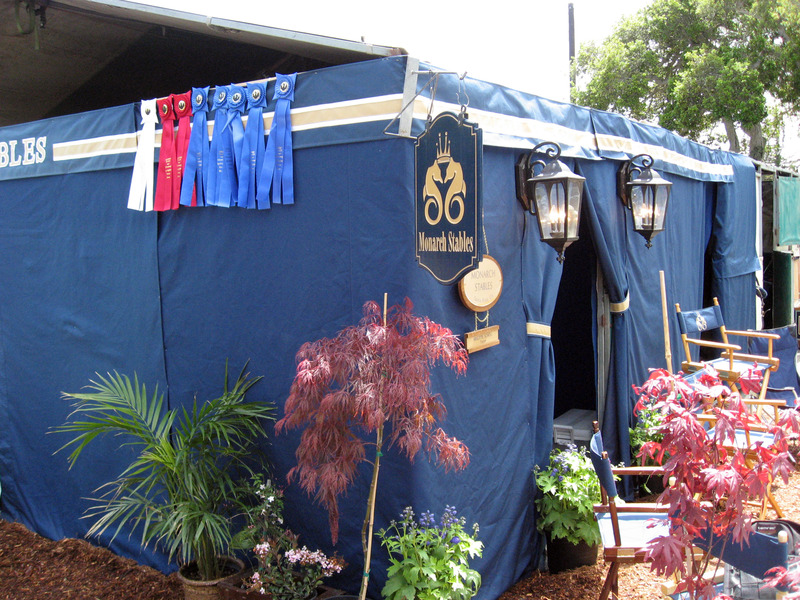 Here is a random picture of the corner of our stables (Monarch Stables) and the ribbons our riders have won so far. A rider getting ready in our stable. 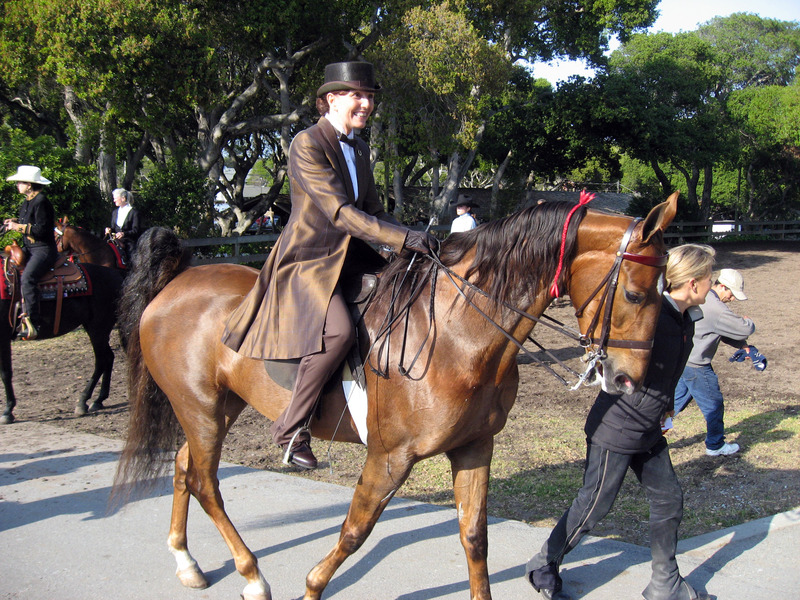 This is Julie getting ready to ride. Sammy (the stable boy, also known as "groom") is preparing the horse. 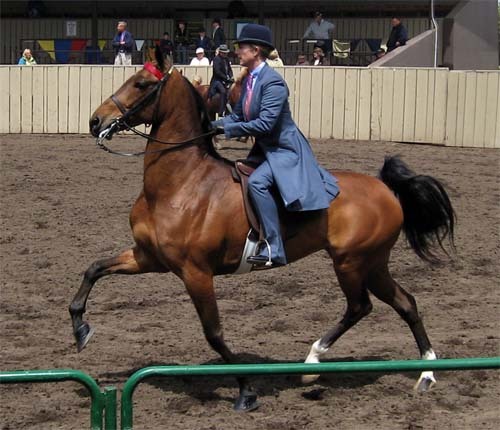 In the picture below he throws the saddle over the horse. And straps the saddle down. I'm told this is called "fastening the girth". 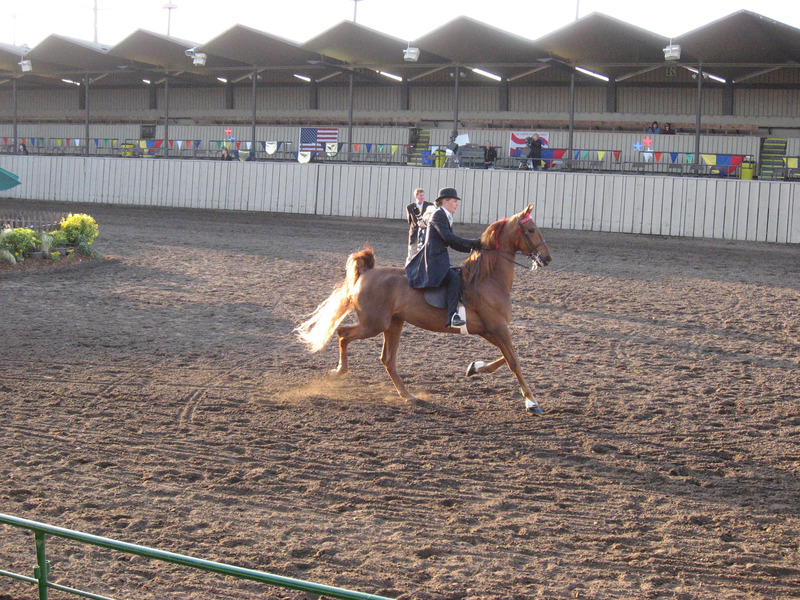 American Saddlebred Horse from our stable (Monarch Stables) in competition. 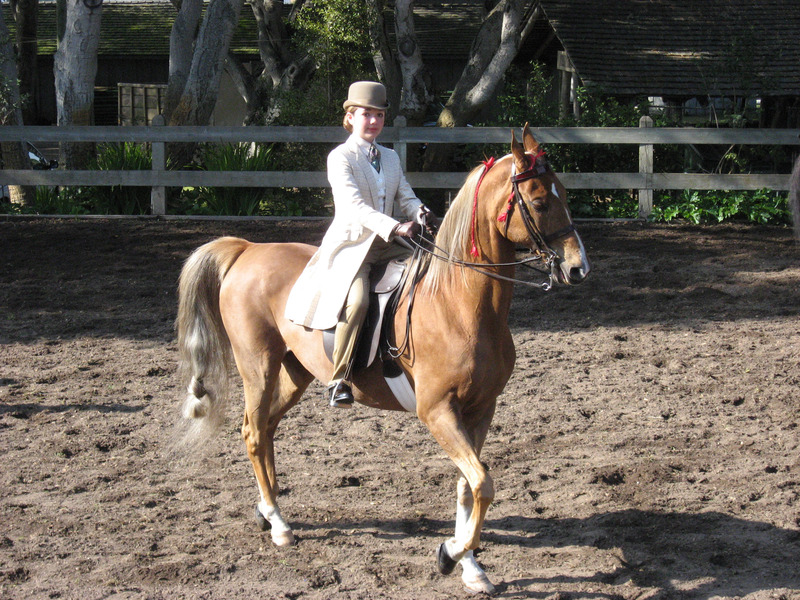 This is Sarah riding Shamrock's Jessica (stable name "Jessie"). More pictures of that competition. 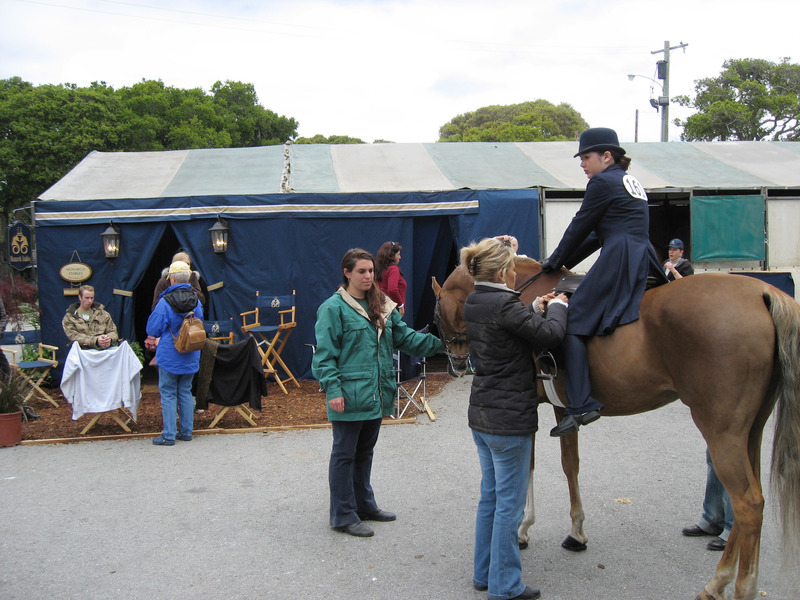 In front is Sarah on Jessie. 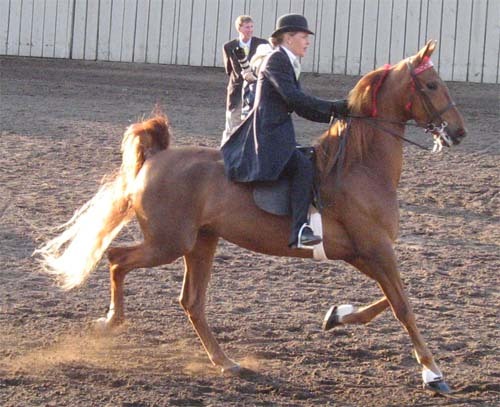 Close ups of one of the riders. This is Julie on Phoebe (her show name is Miss American Phi). 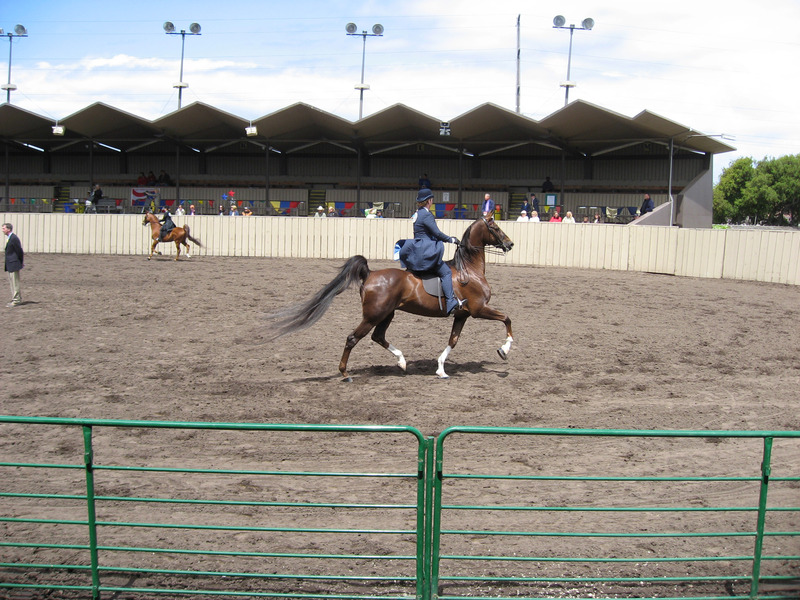 Notice the high stepping of the horses, it is very parade like when these horses slow down. 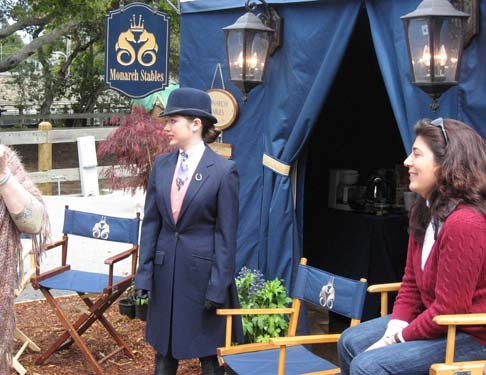 That's Sarah on Jessie to the left. 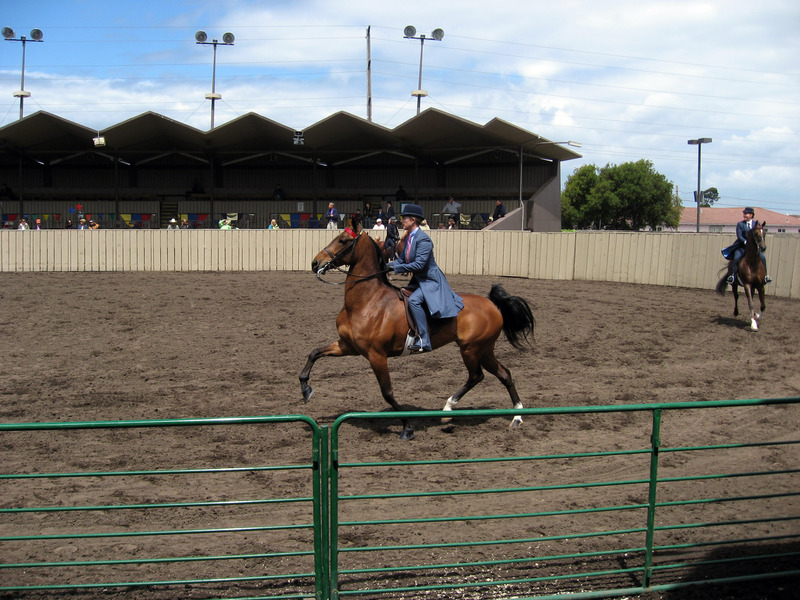 Prancing, parade like horse, high stepping right in front of our seats at the Monterey Fairgrounds. From our stable. That's Julie on Phoebe. The final lineup of this particular competition, to find out who won. 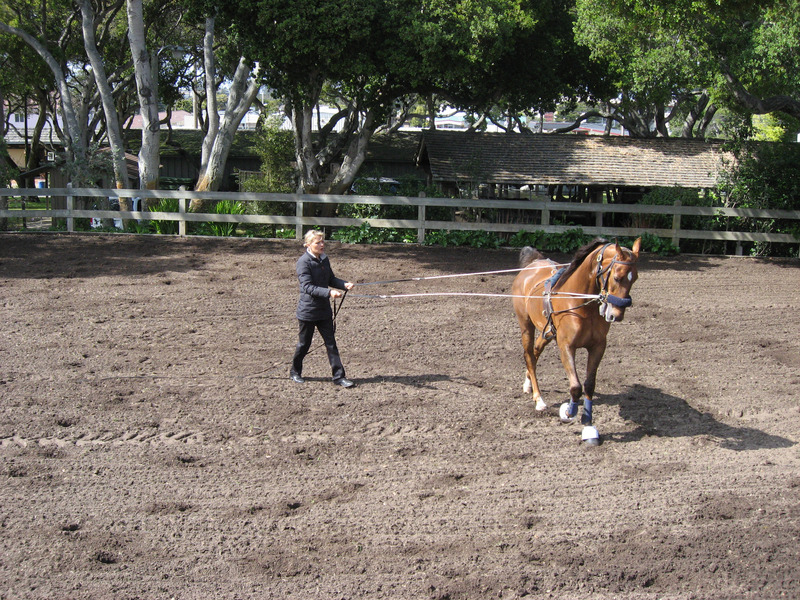 I'm not sure why she did this, but in the only spare moment I saw Brigitte Scholl had all day (the owner of Monarch Stables and head trainer), she took this horse out alone in the practice area and ran it around in circles on this harness. This is called "Long Lining the horse" or "Lunging the Horse" (the word "Lunging" means the horse runs in a circle). In two days I never saw Brigitte sit still, she was in constant smooth motion. 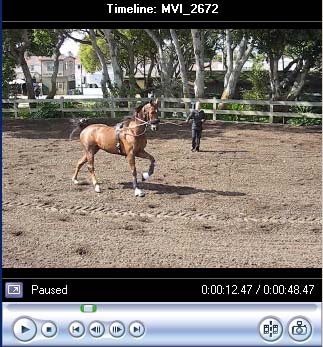 Below is a video of Brigitte Scholl (the owner of Monarch Stables and head trainer) in the warm up area running this horse in a circle with <? ?name of radius line gear??>. Click on the video below to play the YouTube version. You can click Super High Quality Windows PC Version Here for a much nicer, bigger version that will not play on a Macintosh. Below is Melanie dressed up DIFFERENTLY for another competition. In the picture below Melanie is wearing a "Pleasure Suit" for the "Pleasure Riding Competition". 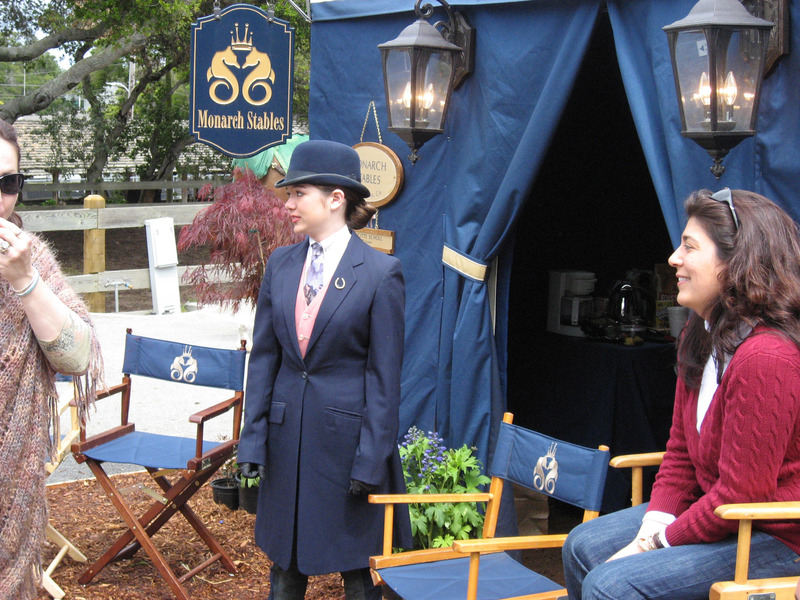 The dark blue suit she was wearing before was for the "Equatition Competition". Below is a video of Melanie in the second competition I watched her in. This time she is in the light tan suit pictured above. Click on the video below to play the YouTube version. You can click Super High Quality Windows PC Version Here for a much nicer, bigger version that will not play on a Macintosh. 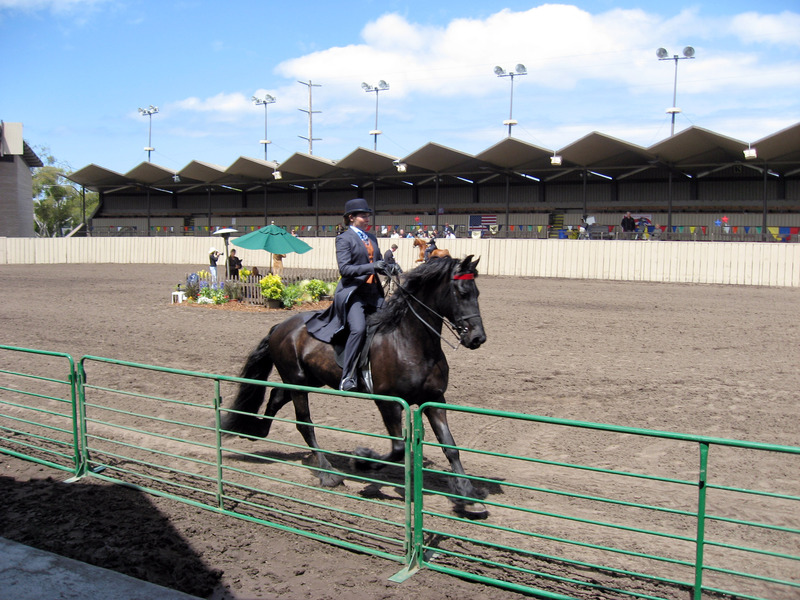 Here is one of our stable's horse and rider coming back victorious from winning a competition. I love that big smile. Brigitte is leading the horse. 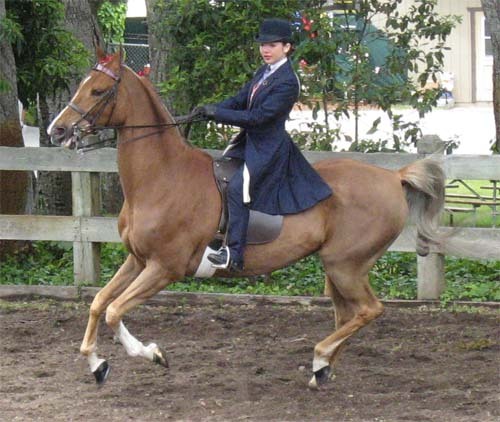 Sherry is riding Maureen. 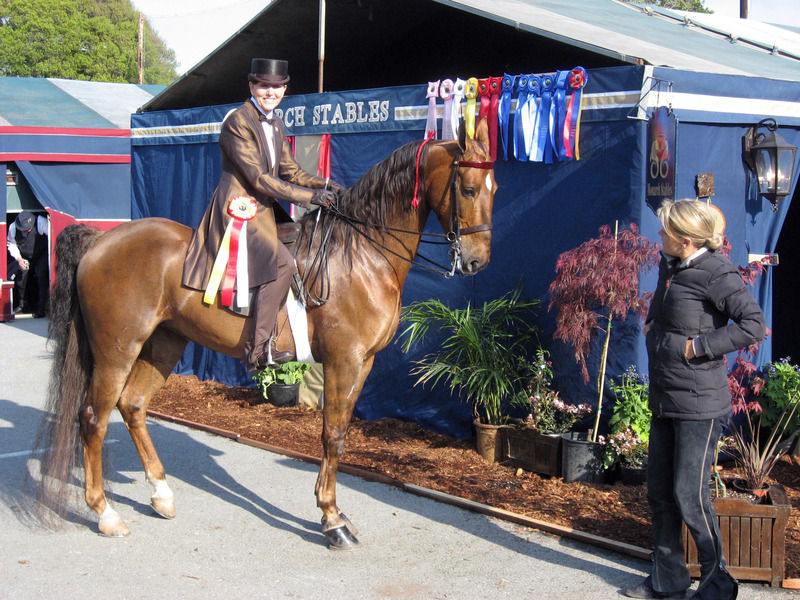 And taking her victory picture by all the ribbons. 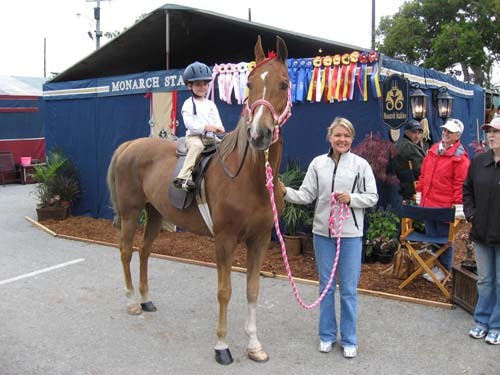 Brigitte Scholl (head trainer, owner of Monarch Stables) herself showed several horses, at least one for an owner who was injured and couldn't ride. 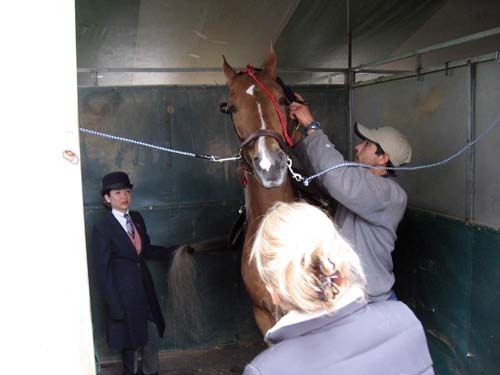 So here she is in the picture below finally the star of the show getting dressed up, helped by the other members of the stable. :-) That is Julie on the left, Brigitte in the middle, and Steph on the right. Brigitte Scholl (head trainer, owner of Monarch Stables) showing the horse below in competition at the Monterey Horse Show. 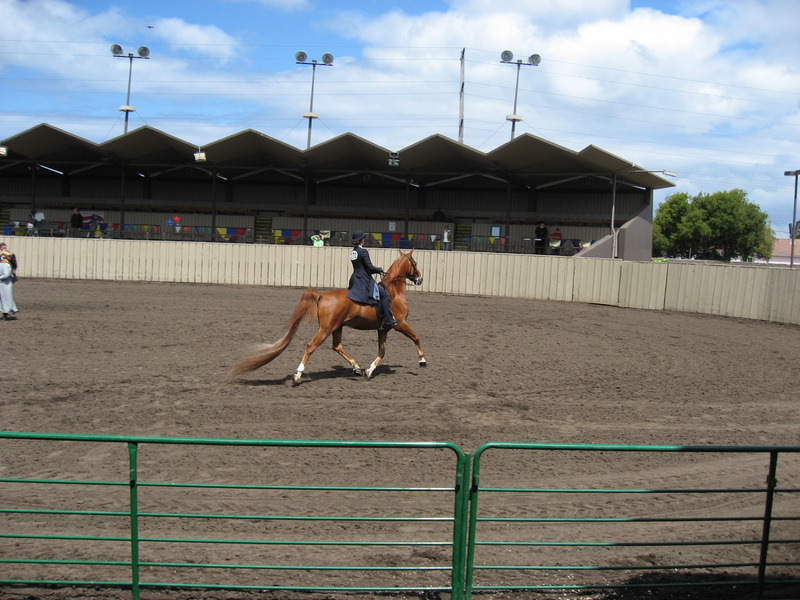 The horse is Pasche. 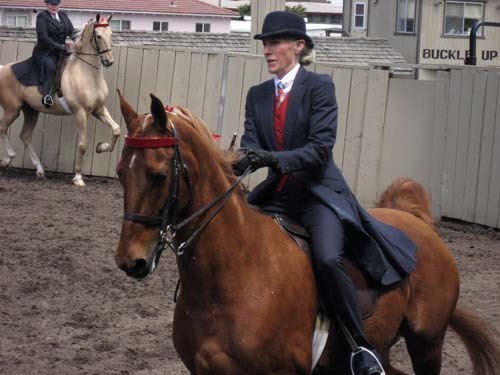 Same ride, below is Brigitte Scholl (head trainer, owner of Monarch Stables) showing the horse below in competition at the Monterey Horse Show. 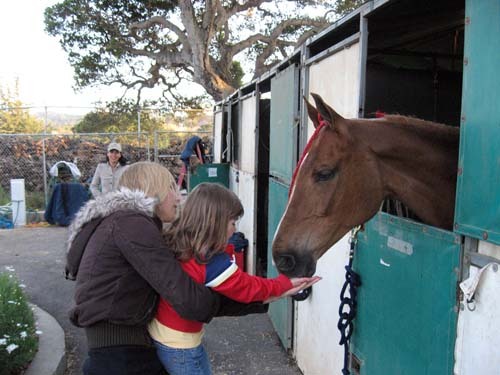 Back around the stables, Samantha (little girl seen below) being held up by Steph to feed the horse. 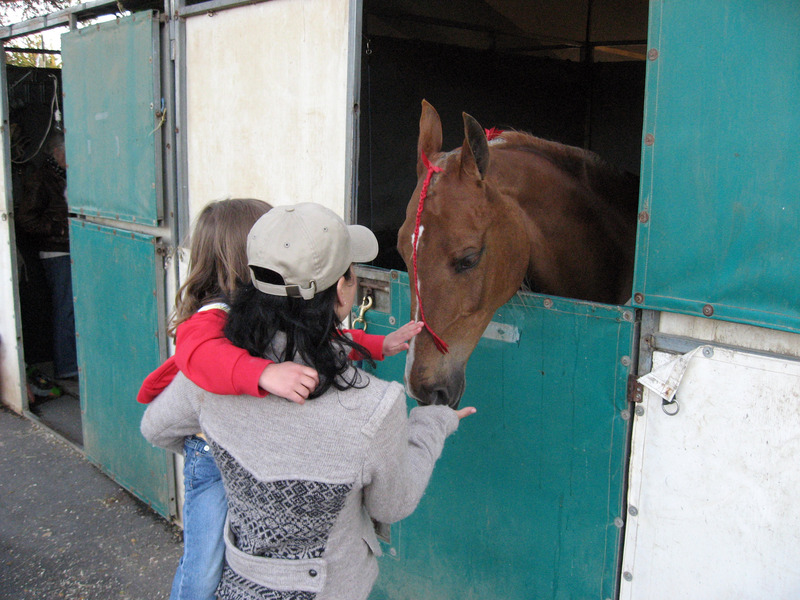 They are feeding the horse a peppermint hard candy, it is a treat the horses like because it has sugar, and it makes the horse's breath smell nice. :-) The horse is Barbie. 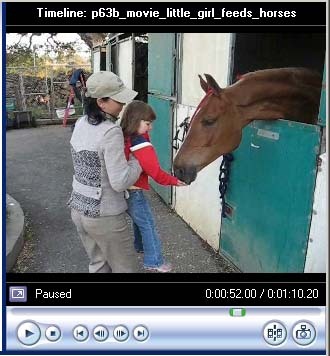 Below is a video of 4 year old Samantha feeding the horse hard peppermint candy, it is SUPER cute! :-) Click on the video below to play the YouTube version. You can click Super High Quality Windows PC Version Here for a much nicer, bigger version that will not play on a Macintosh. 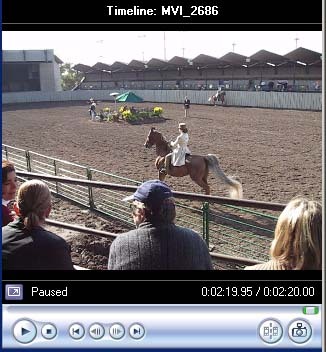 That's Samantha's mom Julie holding her in the video picture below. Click on the video below to play the YouTube version. You can click Super High Quality Windows PC Version Here for a much nicer, bigger version that will not play on a Macintosh. 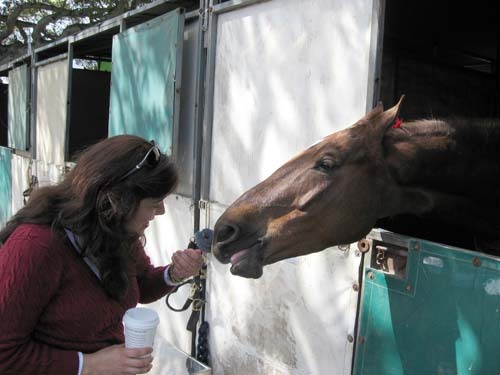 Another picture below, this time Samantha's mom is helping her feed the horse. 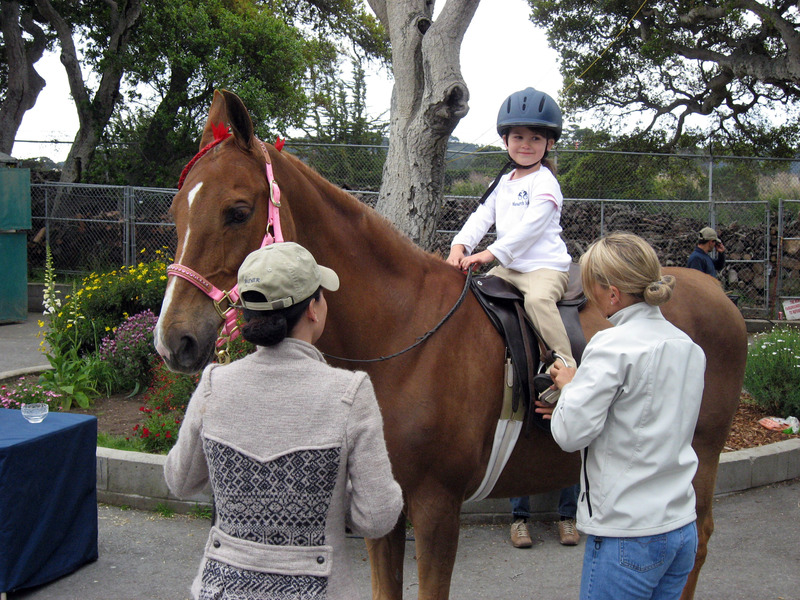 After feeding the horses, little 4 year old Samantha got dressed up in a helmet and went for her first horse ride. 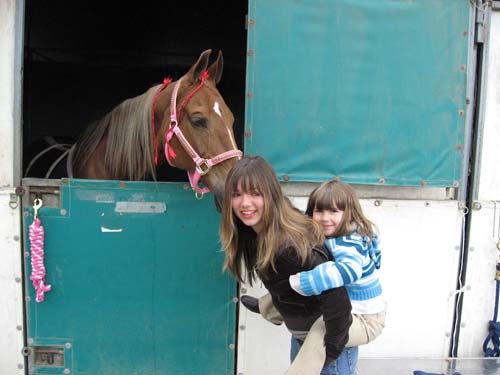 Below Samantha has a huge grin as her Mom and Aunt Brigitte get her mounted correctly atop the horse "Barbie". 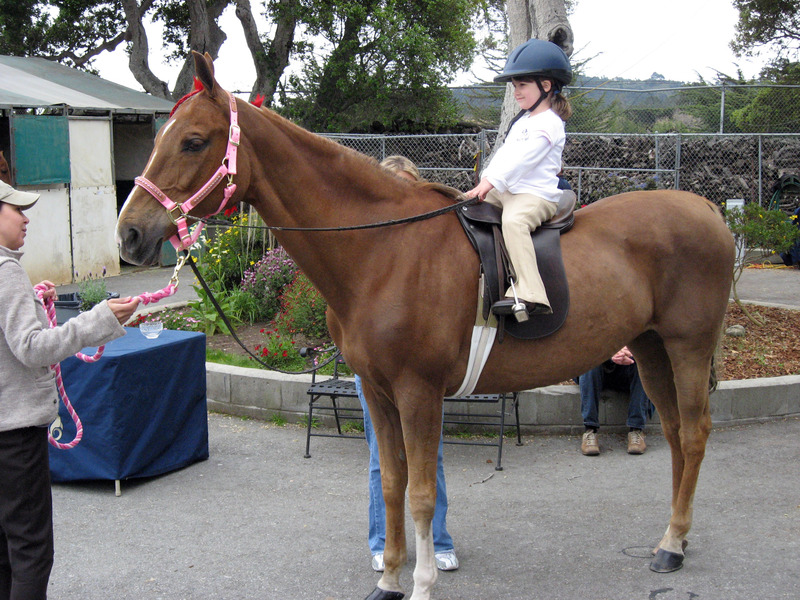 Notice the pink bridle, that was a present to Samantha just for this occasion. Samantha is the center of attention, such a cute little girl (surrounded by 6 other beautiful women in the picture below). Below is a video of 4 year old Samantha going on her first horse ride, led by Brigitte, her aunt. Click on the video below to play the YouTube version. You can click Super High Quality Windows PC Version Here for a much nicer, bigger version that will not play on a Macintosh. 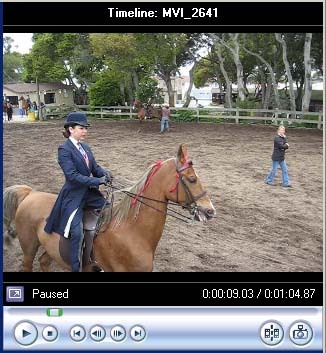 That's Samantha's mom holding her in the video picture below. You can click Super High Quality Windows PC Version Here for a much nicer, bigger version that will not play on a Macintosh. 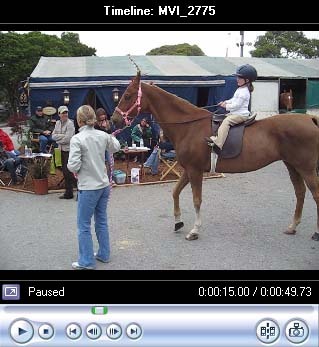 That's Samantha's mom holding her in the video picture below. See, it wasn't just me taking pictures of Samantha. :-) She was very cute. That's Julie on the left, and Allison on the right. Allison is a reporter for the National Horseman. A proud aunt, posing with Samantha. Look at both of those smiles. 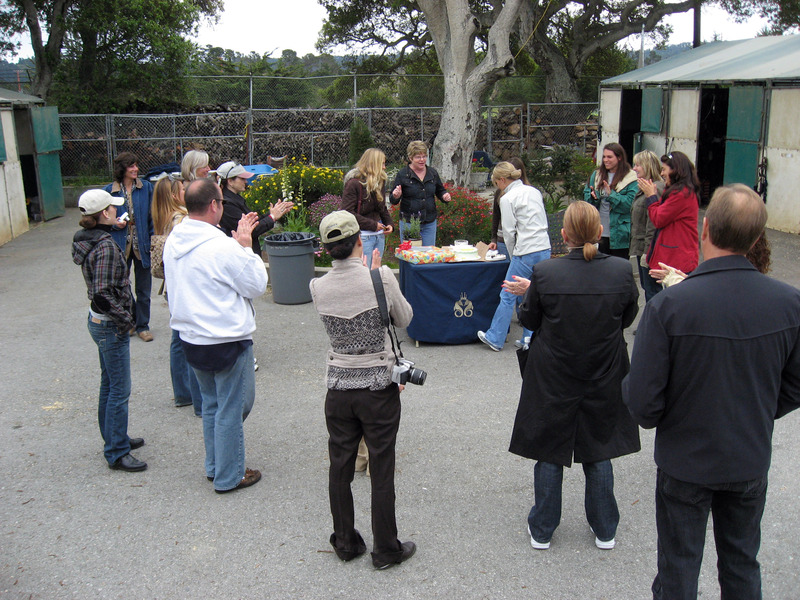 At the end of the day, another stable hosted a party with champagne, strawberries dipped in chocolate, and various other delicacies. 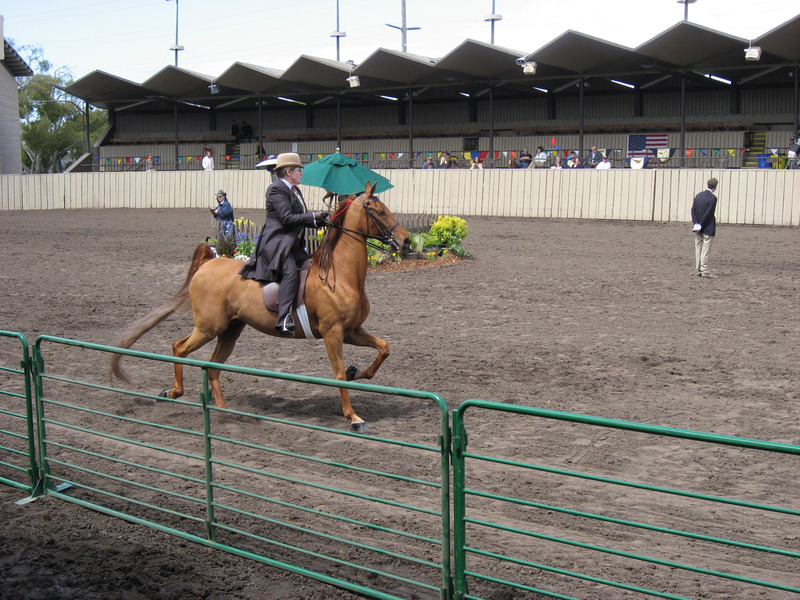 The stable that hosted this event was Sabina Stables out of Tucson, Arizona. Other side of the table at dinner in Carmel. 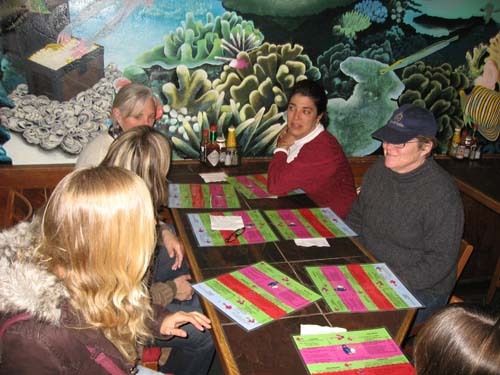 That's Melanie half cut off to the far left, Steph, Lynn, Julie, Christina on the far right in red, and Sarah facing away. The restaurant is Aw Shucks, on Ocean Ave in Carmel. 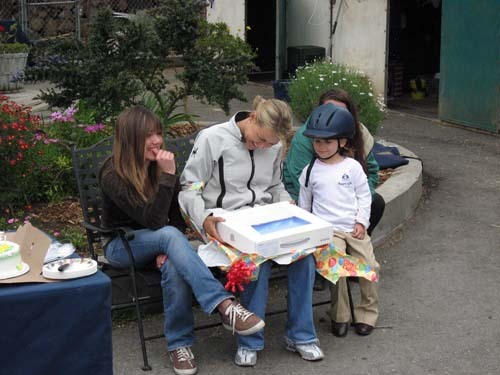 The second day I was there was Brigitte's birthday, so everybody at the stable threw her a surprise birthday party with a cake and some presents. Brigitte unwrapping her present from everybody at the stable -> a new Apple Macintosh laptop. Whew! If you actually made it to here and read this, you have WAY too much time on your hands. :-) I hope you enjoyed reading this page, I had a good time learning about horses and creating this page. If you find errors, or have additional information, PLEASE email me so I can fix this page. Thanks!